Have you checked the latest statistics on crime rates? Sadly, there are only a small number of areas where the crime rates are going down. For some reason, there are more criminals out there and what is even more shocking is that the number of violent crimes is growing rapidly. These criminals are usually preying on victims that they consider weak and rob them. There are many cases where women are attacked because men consider them weaker. If you are a man and a woman that is worried about their safety, you should definitely start training Muay Thai. For those who didn’t know, Muay Thai started as a self-defense discipline many centuries ago and it was used by soldiers, warriors and ordinary people in Thailand. After that it became a sport and a fitness for lose weight activity. Muay Thai training includes the practice of many different movements combined with series of punches, throws, falls and kicks with one goal – disabling the opponent. 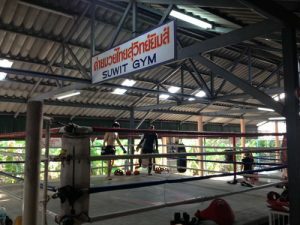 Any individual can travel to Thailand and join a Muay Thai training camp there. You don’t have to be strong or meet certain criteria. This is the beauty of this training. Once you finish this training course successfully you will be able to defeat attackers that are taller and larger than you. Muay Thai training classes are taken on a daily basis and they last for about 1 to 2 hours. In this period of time, the trainer will help you learn some new moves and techniques that can help you protect yourself. He will also encourage you to use some equipment and machines to improve your strength. Don’t forget that Muay Thai training brings many other benefits like the chance to improve your health. Thanks to the intense exercises you will optimize the work of all organs and body parts and improve your health in general. People who are practicing Muay Thai are calmer and more relaxed. They are also more self-confident which makes them unlikely target of street thugs. So, use your next holiday to go to Thailand and start practicing this incredible sport. Coconut water is considered to be one of the most nutritional drink in the whole world. The subtly sweet and salty taste of coconut water not only quench your thirst but also provides a vast scale of benefit for the body and mind. As a Muay Thai fighter, you can use coconut water as a natural electrolyte for your health. The coconut water comprises an array of essential nutrients and minerals that can aid you during your Muay Thai training and keep you healthy during those rigorous exercise and training regime. A medium size green coconut contains 3 grams of fiber, 2 grams of proteins and 9 grams of carbs. Apart from that, it also includes ample of vitamin C, Manganese, Potassium, Calcium along with a few amount of Sodium. The presence of antioxidants helps your body to fight free radicals saving your cells from damage and oxidative stress. Have a cup of coconut water while practicing at your Camp and punch all your anxieties away. Magnesium is known for its anti-diabetic properties. Consumption of magnesium helps in improving the insulin sensitivity of a person while keeping your blood sugar level at bay. If you have diabetes, you can still use coconut water as a refreshment as it is a healthy alternative for electrolytes. The coagulation of calcium and oxalate compounds leads to the formation of kidney stone. Coconut water has unique properties that safeguard your kidney and urinary tracks from calcium crystals and oxalate compounds. Coconut water contains potassium that helps in counteracting the adverse effect of sodium, keeping your blood pressure within a level. So stop worrying and start kicking. A healthy heart leads to more oxygen supply to the body, and more oxygen means more energy for you. One of the best methods in which you can do some exercise is by training martial arts. Of course, you may be a little confused as to what martial art to select – after all, there are all kinds of martial arts that come from the far corners of the world. It’s not that easy to select only one of them and go with it. But if you ask us about it, then if there is a single martial art that we would point out to you – it would have to be Muay Thai. There are many reasons for this. The first reason is that the system of Muay Thai is very powerful. No matter who you are or what your starting point is, you will find out that your strength and your martial arts skill improves dramatically as times goes on. Don’t expect changes overnight, though. 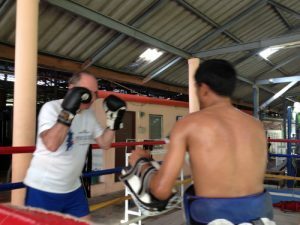 You will find out that the more consistent you are with practice and the more you listen carefully to the instructions of your Muay Thai instructors at the training camp – the faster you begin to improve. The best thing about knowing martial arts is that one day, they can even save your life. If you get jumped by a malicious person on the streets then it can pay off to know a bit of martial arts. You may end up winning the fight and going home without a scratch on you. This would be a lot better than getting all messed up by your opponent. But if there is one thing that Muay Thai can help you with – it’s the development of your character. You will find out that you’re getting more disciplined, consistent, and even courageous as you train martial arts such as Muay Thai. Many timid and scared people have experienced this tremendous improvement and strengthening of their characters and they have become courageous. So, regardless of why you would want to train Muay Thai, we think that it would be a wise investment of your time and effort. Be sure to try it out – as you have nothing to lose in this way. We think that you will eventually end up falling in love with it. Why Should Someone Spend Some Time Training on Their Next Holiday? Those who want to be healthy should take care of two simple things – their diet and their level of physical activity. There are many sources where you can learn more about healthy diets and nutrition, so we will leave this to you. On the other hand, when it comes to physical activity for improving health some people might find this issue a little bit difficult because they don’t have sufficient time or they find training very difficult and boring. No matter what causes you lack of physical activity, it is the best idea to use your next holiday to solve this problem. For many people this period of the year is the time when they just want to relax and don’t do anything else but sunbathing and swimming. However, this is not how you can radically change the condition of your health. You must get involved in organized training like Muay Thai training in a camp in Thailand. Just think about it – if you decide to take your holiday in Thailand, you will get a chance to visit some beautiful beach between (or before or after) training classes and harvest the benefits of this type of training. Muay Thai is a very energetic sport that requires complete dedication from each student. Of course, this is true in case you want to get the best results from your training. Don’t worry about the amount of time you spend in these camps. Even 15 days are enough to see the positive results. Muay Thai training consists of series of exercises from different types – strength, endurance, resistance, cardio etc. Every system, every body organ, every bones, muscle and joint will be activated. The exercises are very interesting and challenging and the professional trainers will help you go through this process in the best possible way. If you want to learn more about self-defense, if you want to shape your body and get stronger you should definitely consider joining a Muay Thai training camp in Thailand. Find a training camp in Thailand and book a flight to this amazing country as soon as possible!